- dynamically open a fullscreen image slider (full-width or full-height) with a nice jQuery animation, containing lots of additional images attached to the item (bulk upload – you can upload lots of images with a single click). - Partial Loading in slider – loads images in background on portions for faster performance. Works well with big amount of images attached to a single item. - Social Sharing – the fullscreen sliders in the gallery provide sharing options, so you can easily share your items images on the most popular social networks. By default buttons are included for Facebook, Twitter, Google+ and Pinterest, however there is also an option to include custom buttons code. 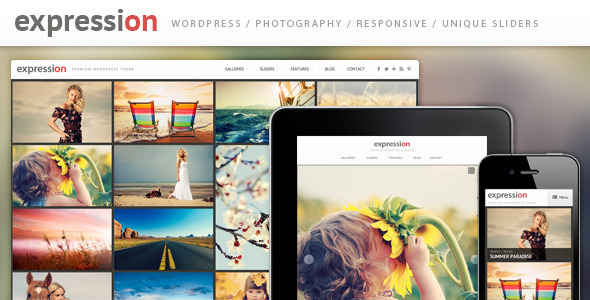 - Easy slider navigation – the gallery slider images can be browsed in different ways – mouse click, mouse scroll, keyboard and touch gestures. The theme is responsive, so that it fits and looks great on different size of devices – desktop, mobile phones and tablets. Also, the main gallery slider supports finger gestures, so it is very easy to navigate between the images on touch devices. The theme includes options to change all the main colors used – you can easily build your custom skin with your favorite colors. You can see some examples here. 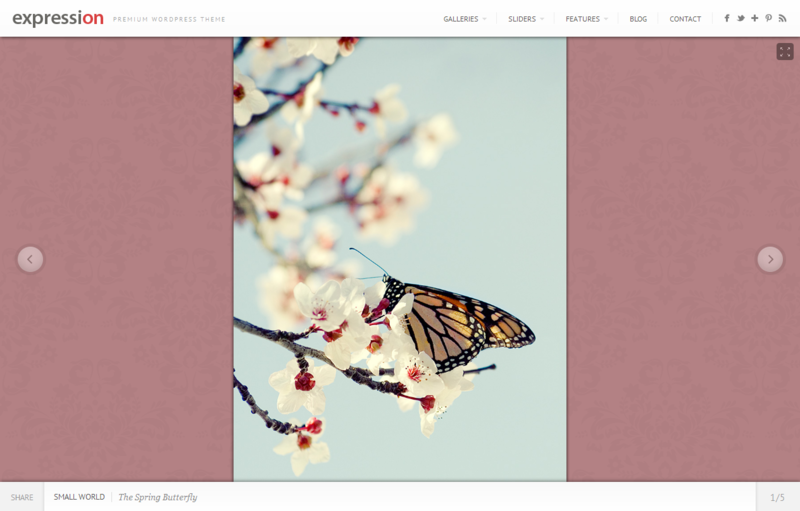 Additionally, the theme comes with 34 different background patterns that you can choose from and if you would like to use your own custom background, the theme also provides an option to upload your own background pattern image or full width background image. 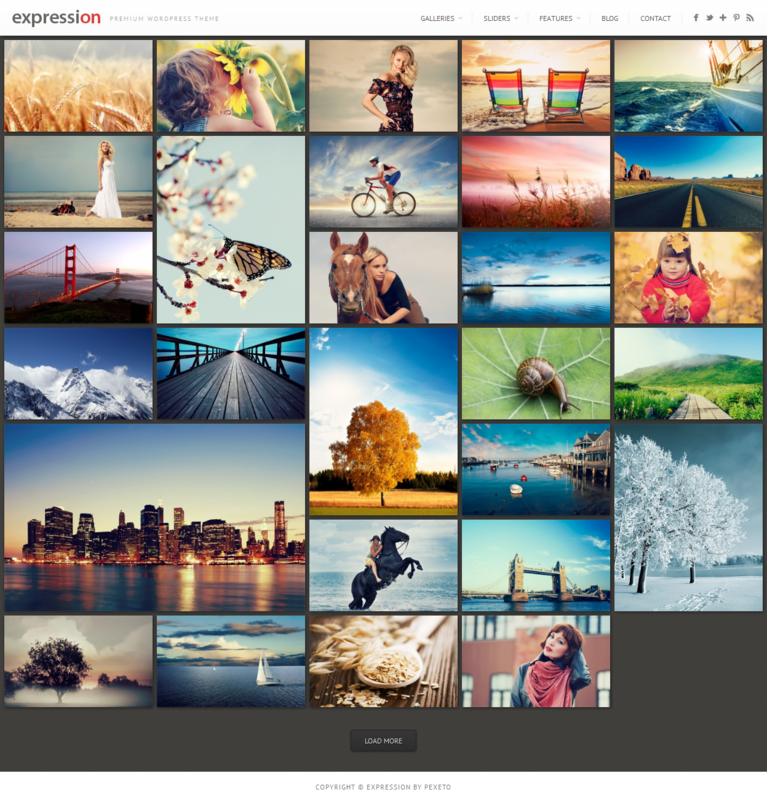 We have included retina display optimizations for all the main graphics used in the theme. 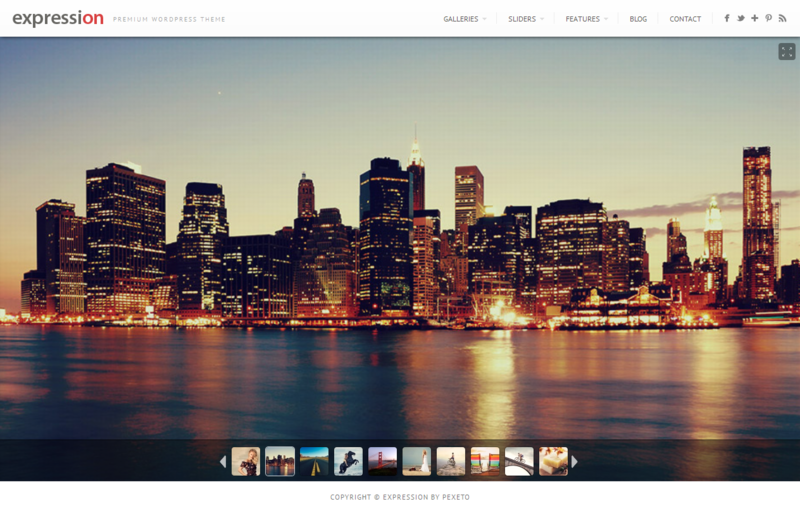 Also, the theme provides an option to set a custom logo image for retina displays. Expression also includes three different sliders that can be included on separate pages – a Full-width slideshow page which displays the images in the full width of the window, a Full-height slideshow page which displays the images in the height of the window and a Nivo slider, which comes with lots of different animation effects and can be used in standard pages with additional content below. 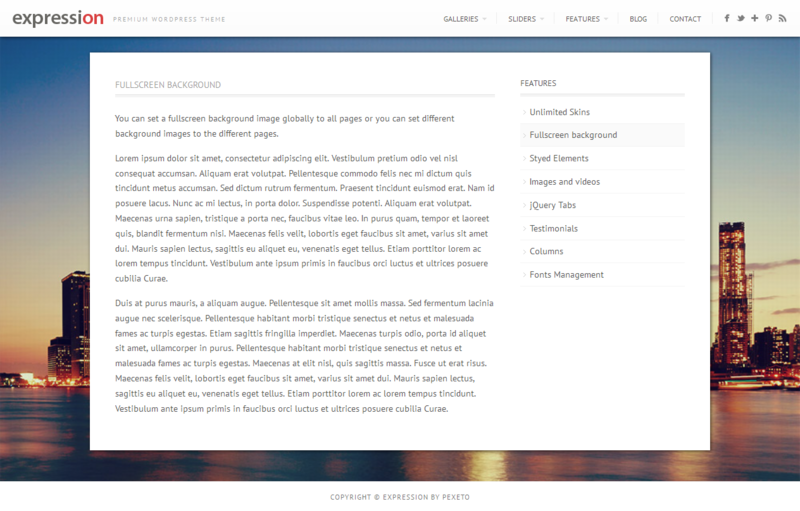 The theme includes an unique set of buttons that allow you to directly insert the styled content into your editor area. In this way, you can easily organize your content while creating it without having to save and preview your page with every change you do. The WP/LR Sync service can be used to publish / export your photos and collections from Lightroom to WordPress and to keep them synchronized. Jordy Meow, the creator of WP/LR Sync has recently released a Pexeto Theme extension that adds support for our themes to the WP/LR Sync service – with this extension enabled, the portfolio items (and their categories) in Expression will be synchronized with your Lightroom (photos, collections, and collection sets). Please note that the WP/LR Sync service does not come with the theme and has to be purchased separately. The theme comes with a detailed documentation, which includes examples, screenshots and all the main instructions you will need to customize your site. Additionally, we have included a “Beginners” section which includes some helpful links about working with WordPress and instructions about what steps to follow when setting the theme. 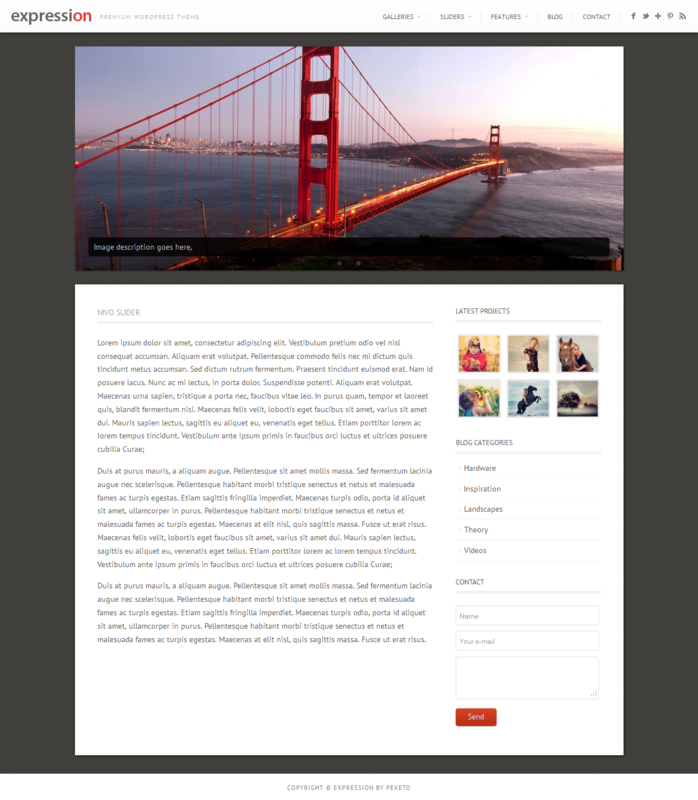 This theme supports the WordPress classic editor only and a major part of its elements rely on the classic editor. This requires installing the Classic Editor plugin. SEO section included, allowing you to add key words, change title structure, exclude pages from indexation, etc. Easy theme translation – all the custom words used within the theme can be very easily changed from the admin panel. We have also included a .po file if additional languages will be used. - Preparation for WordPress 5.0: Make the Classic Editor plugin required by default. The theme supports the classic editor only and a major part of its elements rely on the classic editor. You can learn more in this article. - Removed the Envato Toolkit Library that handles automatic updates due to the retirement of the old Envato API (that Envato Toolkit uses). Implemented a script to install the Envato Market Plugin, which is the new tool to install automatic updates from the dashboard. For more information please refer to the Updates section of the documentation. - Fixed a small issue about the number of the images that is displayed on the item in the gallery not being correct when the images are not attachments of the portfolio item. - Child theme support: the initial release of the theme included child theme support for all the main styles and all the page templates. In this update we have also included child theme support for all the functions used in the theme. 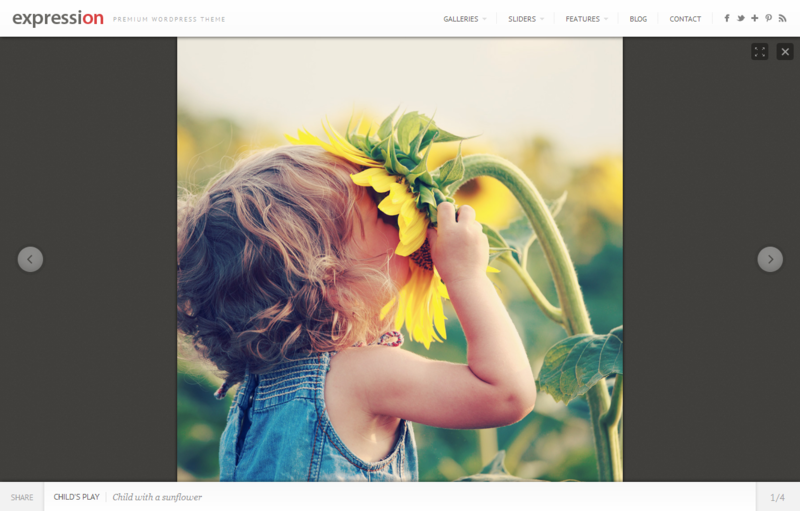 - Implemented improvements into the PrettyPhoto lightbox plugin for mobile devices – now images are displayed to the full size of the screen on mobile devices.